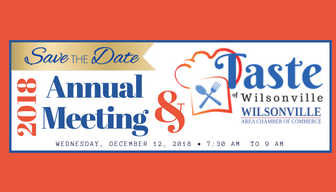 Save the Date for our 2018 Annual Meeting & Taste of Wilsonville! This year’s Annual Meeting will encompass many of the traditional elements of the Chamber Annual Meeting, but we’re also looking to change things up this year. We’re launching our inaugural Taste of Wilsonville where you will get to enjoy catered food from local Chamber restaurants, caterers, and bakeries. Partnering with our local eateries will bring a whole new element, plus it will shine a light on our many outstanding restaurants, caterers, and bakeries in our membership. We’ll continue to honor the business community and look ahead to the next year as well as celebrate and thank our volunteers, committee chairs and outgoing board members. As always, there will be time to connect with other members, be entertained and win some great prizes too! More details to come on the agenda for the evening. But, please, please plan to join us! Business Vendors: Do you have a product and/or service you want to promote with the Chamber Community? Exhibit Your Business at the 2018 WACC Annual Meeting! Exhibit space is $35 + one raffle prize valued at $25 or more. Limited spaces available. Download the application Vendor Application.